At Cook, Bradford & Levy, LLC, we are avid cyclists who understand first-hand the risks and rewards that come with bicycling along Colorado’s roads and trails. But we are not the only ones who love riding our bikes! Did you know that national cycling data shows that 34% of Americans age 3 and older rode a bicycle in the past year? This statistic, provided by the Governor’s Highway Safety Association, takes into account all of America. As you might expect, for Colorado cities and towns with a culture of getting outdoors and cycling like Longmont, Lafayette, Louisville, Erie, and Boulder, this statistic is likely much higher. 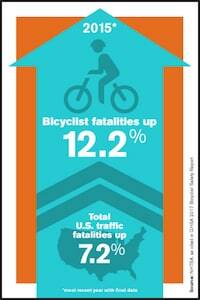 Unfortunately, with more people bicycling, the likelihood of getting hit by a car while on your bicycle increases. In fact, the number of bicycle fatalities has been steadily increasing, and in 2015 it increased by 12.2% from the year before. If you or a loved one has been hurt or killed in a bicycle accident in Longmont, you will need someone who can help advocate for you and your family. We invite you to call our experienced Longmont bicycle accident lawyers today at 303-543-1000 for a free consultation about how we can help you. Cook, Bradford & Levy, LLC’s managing partners, Brian Bradford & Jason Levy, are enthusiastic cyclists who each year put hundreds of miles on their mountain bikes on trails across Colorado, but especially in Boulder County and the Golden area. Both Brian and Jason intimately understand Colorado’s rules of the road that apply to cyclists, cars, trucks and motorcycles alike, and while mountain biking is by far their favorite hobby, they are highly accomplished lawyers in the area of personal injury law and the subset of bicycle accident law. In Brian and Jason, unlike many law firms focusing exclusively on bicycling accident law, Cook, Bradford & Levy, LLC has two Longmont bicycle accident attorneys who have collectively presented over 75 cases to juries in courtrooms across Colorado and Maryland. When it comes to choosing among Longmont bicycle accident lawyers, this is the Cook, Bradford & Levy difference. You may be saying to yourself, “but I don’t want to go to trial.” AND WE HEAR YOU. The fact is that Brian’s and Jason’s trial experience actually reduces the chance that our clients will need to go to trial. Indeed, when an insurance company knows that a Longmont bicycle accident law firm is willing to go to trial if it does not fully and fairly compensate an injured cyclist, it is more likely to offer a fair settlement. Given our track record of litigating cases when we need to, we believe that insurance companies like State Farm, Farmers, GEICO, Progressive, Travelers, and others, are more likely to come to the table and offer our clients fair settlement value for their claims. What is Unique About Bicycle Accident Cases? Bicycle accidents are different from car accidents because, quite often, a cyclist is seriously injured. Quite simply, bicycles, e-bikes, and motorcycles lack the protective structure that a cars and trucks have, which increases the likelihood of serious injury in a crash. The severity of bike accident injuries often means that the at-fault driver’s insurance is not enough to cover the cyclist’s damages, and this is why we strongly recommend Longmont cyclists carry the most UM/UIM insurance that they can afford. A robust UM/UIM policy generally will cover a cyclist in an accident with a car or truck when the accident is not the cyclists fault. Not only is liability (who was at fault for the bike accident) sometimes an issue in bike accident cases, but bike accident cases also can require a knowledgeable Longmont bicycle accident attorney to work up the damages the cyclist suffered. At Cook, Bradford & Levy, LLC, our Longmont cyclist lawyers regularly retain local and national experts when needed to prove the harms and losses that an accident victim has suffered. These experts can range from accident reconstructionists and medical doctors to economists and life care planners, and everything in between. If you or a loved one has been hurt in a Longmont bicycle accident, we invite you to call our Longmont bicycle accident attorneys today at 303-543-1000 for a free consultation about your case.